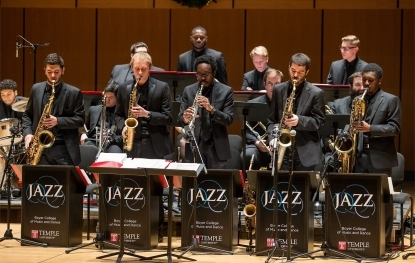 The Temple University Jazz Band performs songs by Count Basie, Duke Ellington and Thad Jones. The Temple University Singing Owls Campus Community Choir joins the band to perform three new choral arrangements by Rollo Dilworth of African American spirituals set to gospel and jazz styles for choir and big band: "Take Me to the Water," "Swingin' Sweet Chariot," "Walk in Jerusalem." Premiere performance of "Climbin' Higher Mountains," arranged for choir and rhythm section by Kirby Shaw with added big band accompaniment by Rollo Dilworth as a tribute to the late Aretha Franklin.